Russia (54% of the adult population aged 25 to 64 hold a college degree). Several items stand out about the United States’ rankings. First, while a relatively high proportion of its population has a college degree, the rate of growth in college degrees is relatively slow. The growth rate in post-secondary degree holders in the United States is increasing by about 1.3 percent per year, about 1/3 the OECD average growth rate of 3.7 percent, suggesting other countries could overtake the United States in the near future. Second, while the United States ranks fifth overall, it falls to 14th if we only consider young adults (aged 24 to 34) with a college degree. Finally, education remains unevenly distributed in the United States. We know that the likelihood of earning a college degree increases with the education level of the parents. Students whose parents hold a college degree are far more likely to earn a college degree themselves. However, in the United States this pattern is far more pronounced. 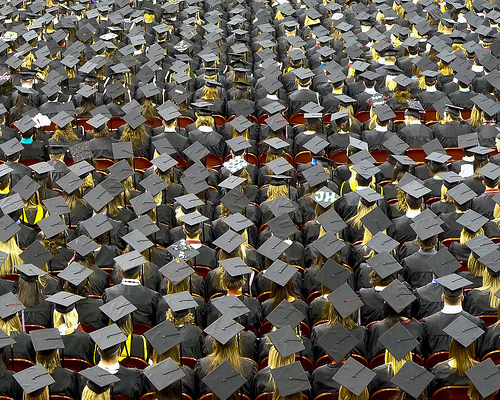 Indeed, according to the report, the odds that a young person in the United States will be in higher education if his or her parents do not have a college degree is just 29 percent—one of the lowest levels among all OECD countries. Finally, the OECD report notes that the individual cost of attaining a college degree in the United States is higher than in almost every other OECD country. All interesting points to consider as we continue to discuss the future of higher education in the United States. 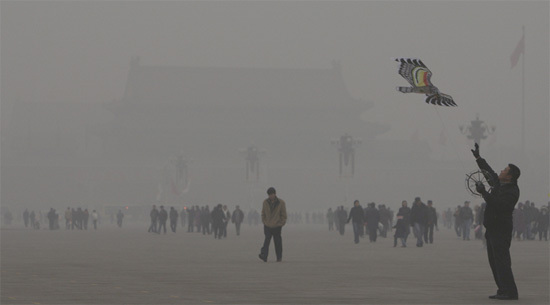 Beijing, the World’s 10th Most Polluted City. The Organization for Economic Cooperation and Development released some interesting data yesterday, which was picked up on by the Guardian’s Datablog. First, have a look at the three minute video produced by the OECD highlighting its findings. Then have a look at the Guardian’s Datablog graphics, which provide a side-by-side comparison of the composition of the global economy in 2011 and the projected figures for 2060. The key takeaway point here is that the United States’ and OECD’s share of global economic activity is in decline. In 2011, the United States alone accounted for 22.7 percent of all global economic activity, and the OECD countries collectively accounted for about two-thirds (64.7%) of the world’s economy. China (17%) and India’s proportion of the global economy respectively will increase from 17 percent and 6.6 percent today to 27.8 percent and 18.2 percent of the global economy by 2060. Economic growth in the developing world will outpace that of the developed world, such that by 2060 the United States’ share of the global economy will have declined to 16.3 percent, and the OECD’s collective share will have declined to 42.3 percent. The data are interesting, but we need to pause and think about what they actually mean. A couple of issues emerge. First, as liberal political economy tells us, economic growth is not a zero-sum game. The developing world’s rising share of the global economy has not been at the expense of the developed world’s economy over the past forty years. Rather, as the “economic pie” has grown larger, countries like China and India have been able to capture a larger portion of the economic growth. But the changing structure of the global economy does raise other issues which are more zero-sum. Economic growth in the developing world raises concerns over access to non-renewable resources like coal, oil, and rare earth minerals. Already competition over minerals between the United States and China has led China to restrict exports. Further, competition between China and the United States for access to non-renewable resources has escalated. As other countries enter the fray, demand for such resources is likely to intensify. Additionally, the nature of economic growth may give reason for pause. Historically, economic growth has been a highly polluting affair. The environmental Kuznet’s curve suggests that pollution increases with economic growth until a country reaches a particular level of development, after which protective regulations are imposed and the environment begins to improve. In this respect, China’s pattern of economic growth echoes the pattern established by Great Britain, the United States, Germany, and other developed nations as they industrialized. But the prospect of expanded pollution, dramatic growth in carbon emissions, widespread deforestation, and so on raise concerns about the sustainability of economic growth that are not addressed in the OECD report. What do you think? Does the OECD forecast give reason for concern? Or is it merely part of a continuing trend of economic growth in the world? Take the poll or leave a comment below and let us know.